Site of Rochester Parking Day, 09.16.16 – Franklin and (ahem) Pleasant Streets. Scorched earth. Sic transit gloria mundi. Change is inevitable. Change is a law of nature. We know that the landscapes of our cities and towns will change, although we are never certain what that change will look like, or how it will touch our lives. But much of the change in the landscapes of our communities happens suddenly, and erases most of the preceding and precious narratives without leaving a trace of those older tales about our lives in a place. Gone, lost, forgotten. I believe that the best cities – or towns, villages, hamlets – are those that sustain the greatest number of stories of us – our families, who we were, who we are, what we did, what we do, what made sense, what makes sense – intact and legible for the longest time, available to the greatest number of citizens or occupants, visitors or migrants, whether we are coming or going, returning or escaping. I think about this all the time. Our chronicles, our histories, are lodged in real places. 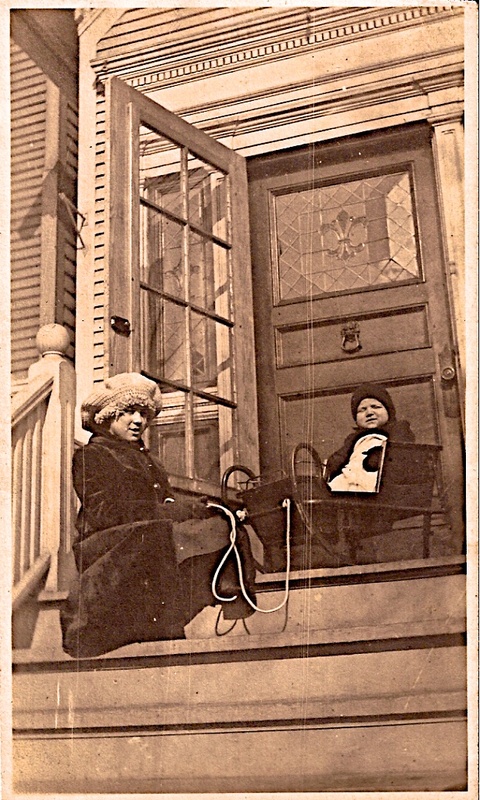 When architect Otto Block made our house the first house on our side of our street, and lived here only yards away from the Eastern Widewaters of the Erie Canal, what was life like? What was he thinking? How were he and his neighbors getting along in that particular lost Rochester? 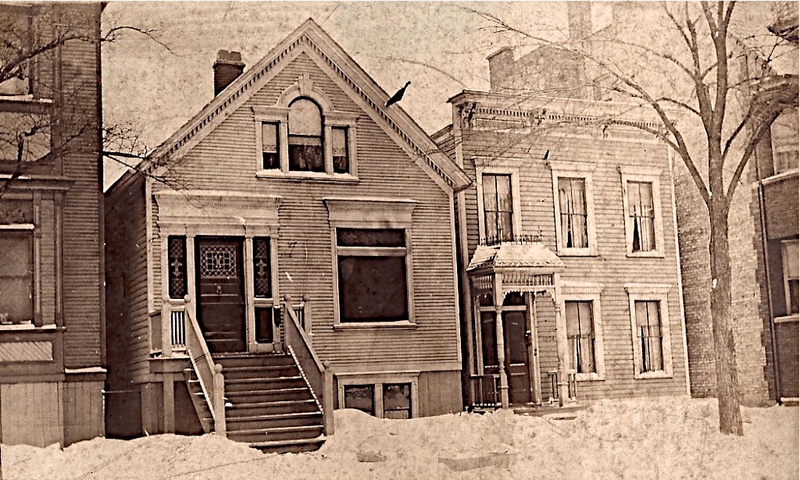 Our house, or Otto Block’s house, in 1906. Today, this part of our city looks like the image below, and in a distressing irony, Amity Street has become Pleasant Street. 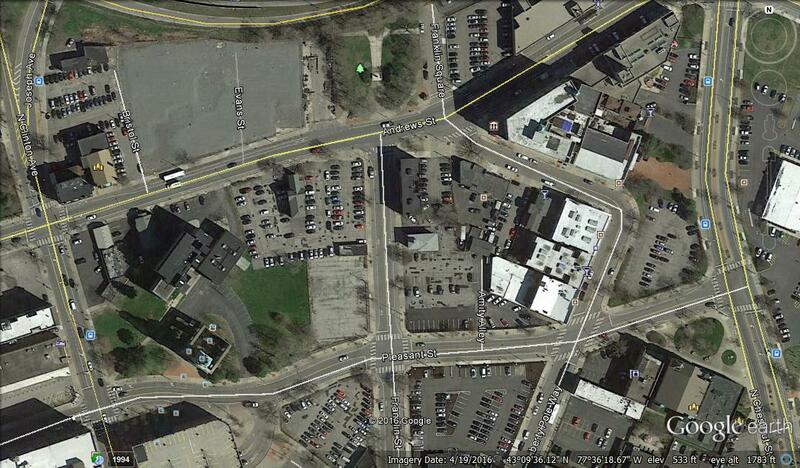 Franklin Square, at the upper red arrow below, was destroyed in the 1950s as the Inner Loop was built. As you can see, plenty of room for parking, and on any day…. 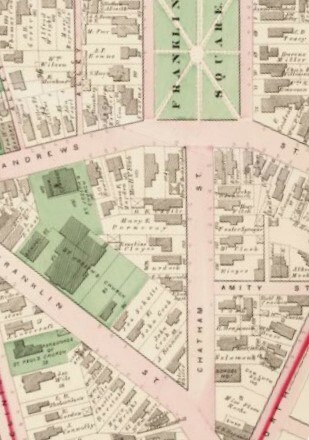 But the house at the lower red arrow, above, is visible on the 1875 plat map. Somehow that building, and the carriage house behind it, evaded the last 150 years of massive destruction. Once, that house belonged to Mary Fitch. 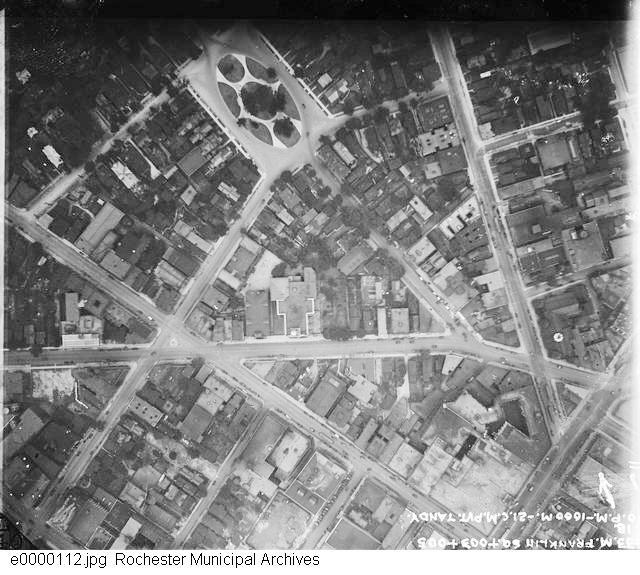 It’s visible here, in 1919, after Franklin Square had been remade by Olmsted and was truly glorious. To orient yourself, rotate your computer about 45 degrees to the right. So Mary Fitch, and her house, are still with us. Mary Leffingwell Fitch. We can open books, and trace her with ease. In 1875 she was a widow, and had been living there since 1866. Her late husband was Ahira Fitch (1799-1865), and before he died they lived at 84 Clinton. 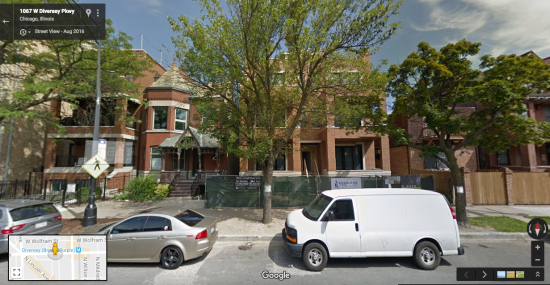 Their house on Clinton is now a parking garage. Ahira was a leather dealer, a tanner, and a currier. He had his gold watch stolen in the spring of 1847. I could go on…. I really would like you to read his thoughts – he is an insightful historian and writer, he is enormously articulate, and he truly understands what it means to treasure our stories. Our Dad’s house looked like this, in 1918. He was 2. (He was delivered by the doctor who lived next door). There he is with his big sister, Vivian. Our time is so short. Our stories are so brief, and then they are gone. But how things got to be the way they are is important, and what happens next is too. When we are gone away, will anyone be able to find the slightest glimmer of what we knew, what we thought, what we loved? Maybe yes, mostly no. We could change much of this: it would only require us to rearrange our priorities. But we have not, and we will not. Once upon a time, in the now-distant 1890s, and after a long and arduous fund raising campaign notable for the $1,000 donation of the President of Haiti, a sculpture to honor and remember Frederick Douglass was begun. Sidney Wells Edwards was the sculptor. 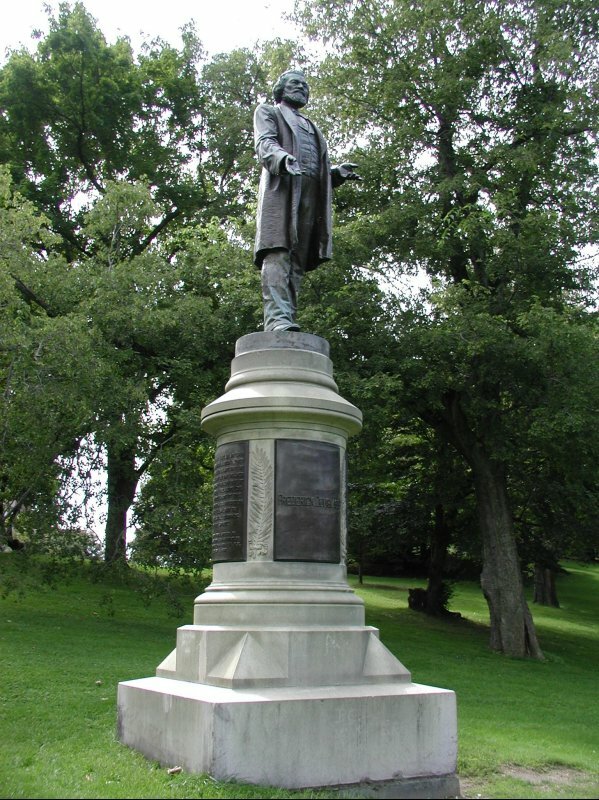 The completed monument was dedicated on June 9th, 1899, five years after Douglass died. 10,000 people attended the ceremony. Teddy Roosevelt, then New York’s Governor, was here. The Frederick Douglass Monument, in front of the train station and not far from Franklin Square. 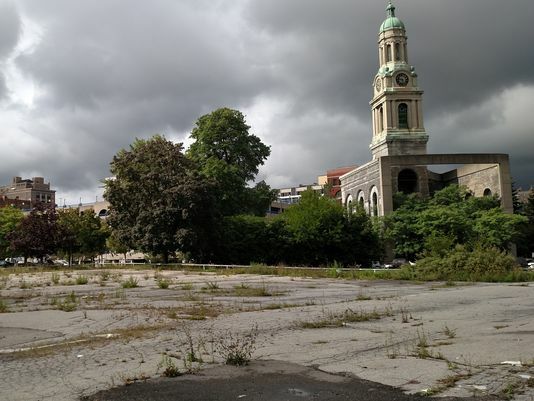 As a side note one potential site, in the Olmsted designed Plymouth Park (now Lunsford Circle), perhaps the oldest neighborhood in the city, was rejected by the neighbors. 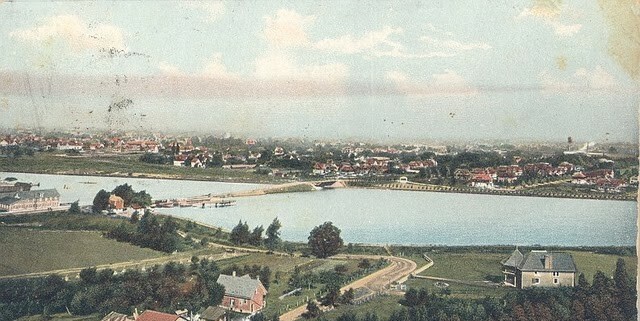 Plymouth Park, in the Corn Hill neighborhood, 1931. For years after the dedication the monument was the site of celebrations and gatherings. 1911 – the Grand Army of the Republic convention. Celesta Foster of New Orleans about to lay a wreath, 1911. Denis Washington holds the umbrella. A celebration at the monument, 1924. After 42 years at St. Paul Street and Central Avenue, and mostly because of the endless railroad traffic nearby, the monument had become “grimy and sooty.” And so a committee was formed, and a decision was made to move the monument to Highland Park. 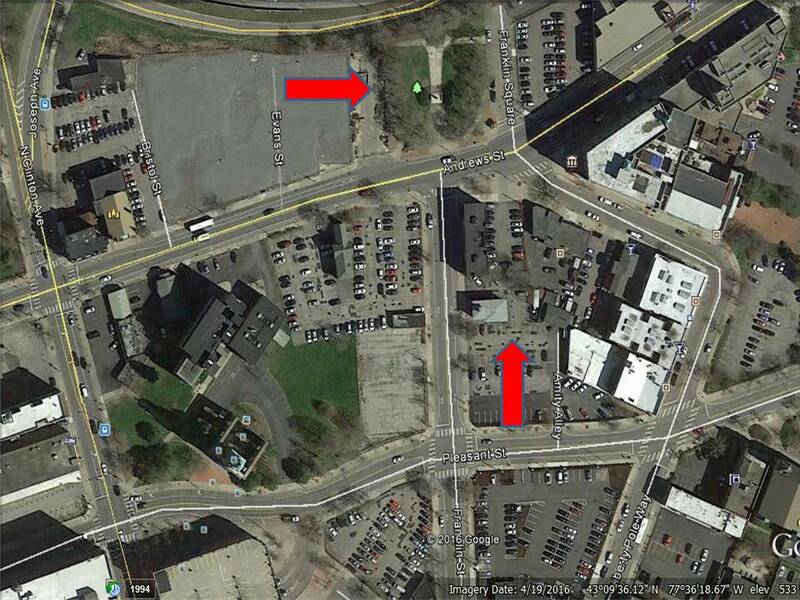 The place in the park for the statue was within a few hundred yards of where Douglass had once lived, on South Avenue. Not exactly the apex of city life, but away from the grime of the trains. And so today the statue stands, as it has for 75 years, in the park. It was rededicated on September 4th, 1941. Not exactly a compelling location, but there it stands. In reflecting on this story, I have found myself longing for a new home for Mr. Douglass, a place that is again a great portal of our city. Maybe where the Inner Loop used to be, because he once lived at 297 Alexander – don’t bother looking it up, it’s a parking lot – just a few feet away. Or perhaps at the entrance to our new train station, soon to become a fitting, and central, urban threshold. Any significant city is measured in some way by its monuments and memorials. These comprise the most important chapters in the narrative of any place. I sense that we are not properly serving a critical moment in our urban story with Mr. Douglass off in Highland Park. He seems so forlorn and abandoned there. We all need to see him, and reflect on his life, every day. And we need his wisdom, now more than ever.